A native of Evanston, IL Kenn went to the University of Michigan as an offensive tackle in 1974. 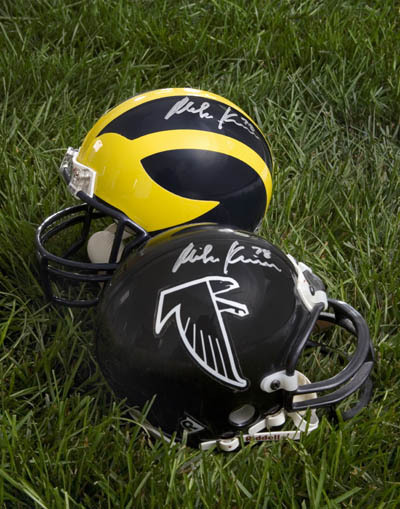 Twice named All-Big Ten (1976-77), Kenn helped lead the Wolverines to three Big Ten championships and appearances in a Sugar Bowl and two Rose Bowls. Growing to 6-feet-7 and 286 pounds, Kenn was a first round draft choice of the Atlanta Falcons, being chosen 13th overall. He starred in the NFL for 17 seasons (1978-94), all with the Falcons, and holds the team record for most games started with 252. During his professional career he missed only nine games due to injury. 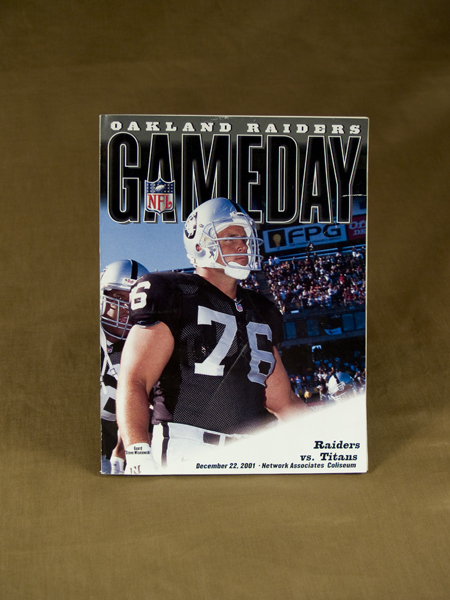 A punishing blocker, Kenn earned the respect of his peers being named to five consecutive pro-bowls from 1980-84. Few could have foreseen a future in the NFL for Mike Kenn back in the fall of 1974 when he was a freshman at the University of Michigan. At a slender 206 pounds, Kenn walked into the coaches’ meeting room for the first time and was greeted, quite skeptically, by coach Bo Schembechler and his staff. His development slowed after suffering a dislocated elbow. Kenn didn’t make an impact upon the program until his sophomore season when he was given an opportunity to start at offensive tackle thanks to an injury to one of the senior starters. It was the beginning of a long career for Kenn, one that had it share of ups and downs. 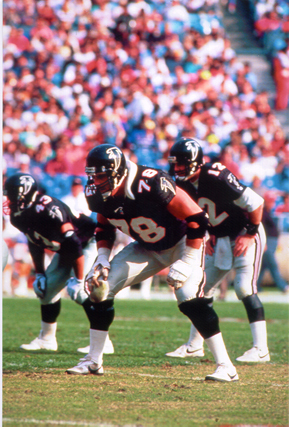 Twice an All-Big Ten selection (1976, ’77), Kenn played 17 seasons in the NFL all at left tackle and all with the Atlanta Falcons. A five-time All-Pro selection (1980-84), Kenn missed just nine games in his professional career due to injury. He was Atlanta’s first pick in the ’78 NFL Draft, and the 13th selection overall. It wasn’t all a bed of roses for Kenn. Of those 17 seasons just four times (1978, ’80, ’82 and ’91) did the Falcons produce a winning record. In ’80 Atlanta had the best record (12-4) in the National Football Conference but lost to the Dallas Cowboys, 30-27, in the second round of the playoffs. The Falcons had received a first-round bye. Even the good times had their downside. Born and raised in Evanston, Ill., Kenn grew up in a Polish neighborhood, one laden with Polish names. Kenn’s real name is Kuchowicz. He attended Evanston High, the only public school in Evanston. Kenn said he is honored to be inducted into the Polish American Sports Hall of Fame. But most of all his emotions in regards to this honor are directed toward his father, Leo, who worked for 37 years and retired as a field superintendent for Climatemp Corp. in the city of Chicago before he died at age 67. Leo Kenn didn’t graduate from high school but was an intelligent person who taught his son much. “I’m proud to be inducted for my dad,” Mike Kenn said. “We grew up with a lot of Polish families and even some of our masses were said in Polish. 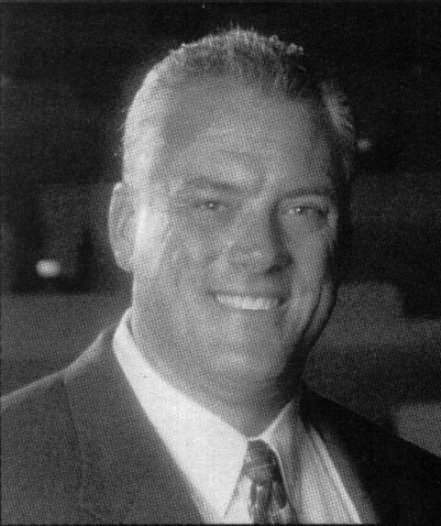 Unlike many athletes who struggled to live outside the world of sports, Kenn’s life, in some ways, was just beginning after he retired following the ’94 season. Currently he’s the president of the Georgians for Better Transportation, a non-profit organization whose mission is to improve transportation conditions in Georgia. “We try to increase transportation spending, and we’ve made great strides,” he said. Kenn spent five years as the Chairman of the Fulton County (Ga.) Board of Commissioners and was in the restaurant business for 12 years before exiting three years ago. Kenn has many fond memories of playing football, and many go back to his days at U-M and playing for Schembechler. He played in two Rose Bowls (both losses, to USC and Washington) but missed playing in the ’76 Orange Bowl his sophomore season because of a leg injury. Perhaps the most memorable game he played as a Wolverine came in the ’76 Ohio State game in Columbus. U-M defeated Ohio State 22-0 and went on to face USC in the Rose Bowl. There was no score at halftime and the Wolverines scored on their first three possessions of the second half. On their third touchdown Schembechler elected to go for two points and made it. 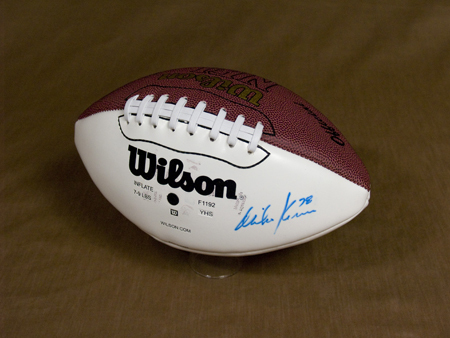 The best player Kenn played against was Leroy Selmon. A defensive tackle, Selmon played on the Oklahoma team that defeated U-M in the Orange Bowl and finished No. 1. Selmon was the No. 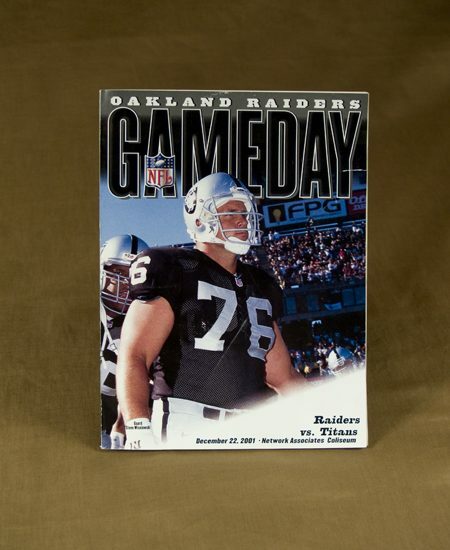 1 pick in the ’76 NFL Draft and was an All-Pro lineman for the Tampa Bay Buccaneers. Selmon played a big part in coach John McKay’s 3-4 defense at Tampa Bay and was one of the more dominant linemen in his day. Despite Atlanta’s losing ways during Kenn’s time there, playing 17 seasons all with one team is an accomplishment that just isn’t seen in today’s game.